You'll be £16.99 closer to your next £10.00 credit when you purchase Yearbook of Astronomy 2018. What's this? 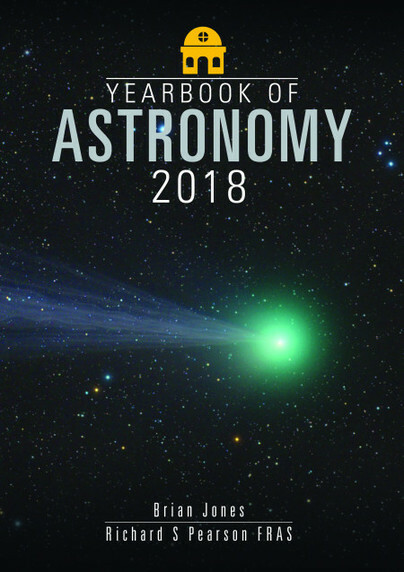 The YEARBOOK OF ASTRONOMY 2018 is a book no stargazer should be without. Recognised by both amateurs and professionals alike as an indispensable guide to the night sky, the Yearbook of Astronomy is one of the only reference books to be fully revised each year. The Yearbook of Astronomy is one of the longest-running series of books on astronomy and the night sky. It first appeared way back in 1962 (well over half-a-century ago) and continues to be, as it was then, the main popular astronomy annual for amateur astronomers. For most of this time the Yearbook of Astronomy was edited by Patrick Moore. Forthcoming editions will endeavour to maintain the popular style and familiarity of previous editions, as well as offering its readers a new, invigorating and inspirational layout and presentation. The 2018 edition contains authoritative sky charts and detailed monthly sky notes that plot a clear path though the year’s eclipses, comets, meteor showers and deep sky objects. In addition the Yearbook of Astronomy features a variety of topical and specially commissioned articles covering a wide range of astronomy-related topics. Bursting with up-to-the-minute information, this collection is essential reading for anyone fascinated by the night sky . . .
I’m so glad this has continued on into 2018. It is such a great resource, and has such great material even for an amateur astronomer. This will inspire you to step outside and look up on a clear night. If you are an astronomy lover, then this is definitely the book for you. In addition to describing all the astrological events that will take place this year, this book includes pictures and diagrams to help readers better the chapters subject matter. In truth, this reads better than any textbook, I ever had for my college Astronomy class. The sky charts, and other plots for the lunar cycle, eclipses, comets, etc., this is truly like an encyclopedia for astronomical matters. Even though the dates are specific for this year as far as when to see what, I wonder if the authors would be interested in creating a basic companion novel similar to be used in Astronomy classes. What an extraordinary resource! I'm going out to get astronomical binoculars now. It was great to read about the astronomy .........wonderful book. A useful book for anyone who loves to look at the stars. Month by month information on what to look for in the night sky, including the moon phases and visible planets. There are sections on meteor showers, comets, pioneers and black holes and plenty more. Also included are the requisite star maps that any astronomy book would never be without, and some beautiful pictures. As an amateur astronomer, it's hard to find books that help expand my knowledge without completely going over my head. However, this book is an excellent, understandable reference regardless of your experience in astronomy. It details all the interesting astronomical events that will occur in 2018. If you love astronomy like I do and are unfamiliar with this book, you are going to wonder why you never knew it existed. Perfect for the inquiring mind, this book has every question about astronomical events that will happen in 2018. It was fun to see the moon phases on a calendar. If you plan on doing night sky photography, I cannot recommend this book enough. A very useful year book for anyone, amateur or professional, who has an interest in Astronomy. There are some interesting articles and updates of events that will occur in 2018. A fantastic reference book for any astronomer, amateur or professional. Practical, well written, inclusive and classic, it's a worthy successor to a long line of Astronomy Yearbooks. Nice book for astronomy lovers. It gives the details about the 2018 astronomical events. Richard Pearson, FRAS, FRGS was born and raised in Nottingham and has worked on local newspapers as a journalist for over 20 years. A member of the British Astronomical Association and a Fellow of the Royal Astronomical Society, he has written several books on astronomy and is the presenter of the monthly internet TV program Astronomy & Space, now in its fourth year, and is a celebrity among members of astronomical societies worldwide. As an astronomy educator, Richard is excited to be involved with the Yearbook of Astronomy, an indispensable book which made its first appearance way back in 1962 and which continues to be the main popular astronomy annual for all amateur astronomers.